This page was set up by Robert Sewell in July 2006 to show the descent of the Sewell Family from Charlemagne and his ancestors. Robert Sewell graduated from McMaster University (Hamilton, Ontario, Canada) in 1967 with a B.Sc. degree in chemistry. After a year of studies at the University of Toronto's College of Education, he taught high school science in Collingwood, Ontario for a year and then taught chemistry, physics and general science in Hamilton, Ontario for twenty-nine years. Robert Sewell retired from teaching in June 1998. Franks were members of a confederation of Germanic peoples that attacked the Roman Empire beginning in the A.D. 200's. The Franks were divided into two branches, the Salians and the Ripuarians. The Salians settled in the Low Countries on the lower Rhine, near the North Sea. The Ripuarians moved into the region around what are now the cities of Aachen, Trier and Cologne, Germany, in the region of the middle Rhine. Frankish history is divided into two periods. These periods are the Merovingian, from about 481 to 751, and the Carolingian, 751 to 987. Charlemagne, who was king of the Franks from 768 to 814, created a vast empire. In 800, Pope Leo III crowned him emperor of the Romans. After the time of Charlemagne, the Frankish empire began to break up into what later became the kingdoms of France, Germany, and Italy. Our genealogical history begins with Clovis, a Ripuarian Frank who was King of Cologne in the early 5th century. It should be noted that many of the kings at this period of history were really just tribal chieftans; and that this is not Clovis I (466? 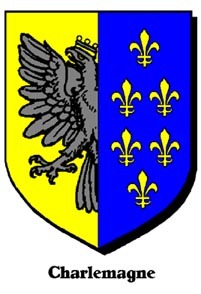 - 511) who founded of the Merovingian Dynasty. Clovis, a Ripuarian Frank who was the King of Cologne circa 420 AD. Frankish "kings" at this time were really just local tribal chieftains. Childebert who was a the King of Cologne circa 450 A.D.
Siegbert the Lame who was the King of Cologne. Cloderic the Parricide who was briefly the King of Cologne. Cloderic murdered his father in 509, and was himself murdered the same year by Clovis I, the founder of the Merovingian Dynasty. For more about Clovis I and the times in which he lived, click on The Merovingians. Munderic was "very young" in 509 when his father was murdered by Clovis I.
Munderic revolted against Thierry (I), a son of Clovis (I), who killed him. Died on July 6, 607. St. Gondulfus was Bishop of Tongres (consecrated in 599), Governor of Marseilles in 581 and Mayor of the Palace to Theibert (I). St. Gondulfus is almost certainly the father of Duke Bodegisil (II); see F.L. Weis, Ancestral Roots, Baltimore, 1999, 190-6. Other earlier works including George Andrews Moriarty: The Plantagenet Ancestry of King Edward III and Queen Philippa, Mormon Pioneer Genealogical Society, Salt Lake City, Utah, 1985, pages 5 and 241, show St. Gondulfus' brother Duke Bodegisil (I) or perhaps another brother, name unknown, of St. Gondulfus and Duke Bodegisil (I) as the father of Duke Bodegisil (II). While it may seem strange to us to-day for a "saint" and a "bishop" to have had children, this was not the case in early mediæval times. Married clergy were the rule rather than the exception until Gregorian reforms of the 11th century. By the late middle ages, there were virtually no married clergy. St. Gondulfus was a political figure; he was Governor of Marseilles and Mayor of the Palace and was not consecrated until quite an old man in 599. As well, it was very unusual among the early Franks for a son to have the same name as his father as would be the case if Bodegisil (I) had been the father of Bodegisil (II). The same name was used to indicate a close kinship such as the uncle and nephew relationship here. Duke Bodegisil (II) was the Governor of Aquitane. St. Arnoself of Metz was the Bishop of Metz and is also known as Arnold, Arnulf and Arnuiph. He was a member of the court of the Frankish king Theodebert (II) of Austrasia. A noble, Arnoself married Doda, and their son was Ansegisel. Doda became a nun, and Arnulf made plans to enter a monastery but was named the bishop of Metz around 616. He continued his court services, making Clotaire of Neustria the king of Austrasia. He also served as counsellor to Dagobert, King Clotaire's son. In 626, Arnulf retired to a hermitage at Remiremont, France. His feastday is July 18. Duke Ansigise who was Mayor of the Palace in Austrasia in 632 and is also known as Anchises, Ansegisel and Ansegilius. Married: St. Bégue or Begga, daughter of Pépin the Old of Landen who was Mayor of the Palace of Austrasia in 623 and a counsellor of Dagobert (I), King of Austrasia. St. Bégue's mother was St. Itta, said to be a daughter of Arnoldus, Bishop of Metz, said to be a son of Ansbertus, the Gallo-Roman Senator and his wife Blithilda. On the death of her husband in the year 691, St. Bégue built a church and convent at Andenne on the Meuse River and died there. Her feast day is December 17th. Pépin of Heristal who was Mayor of the Palace in Austrasia. Charles "The Hammer" Martel who was the Mayor of the Palace in Austrasia, and as such, was the virtual ruler of France. Please click on Charles Martel for further details. Carloman who ruled Neustria, Burgundy and Provence as Mayor of the Palace from 741 until 747 when he retired from political life and became a monk at the Monastery of Monte Casino. He was succeeded by his younger brother Pepin the Short. Grifo, who was endowed with a portion of his father's land, but was displaced and imprisoned by his half brothers Carloman and Pépin the Short. Chiltrud, who married in 749 to Odilo, Duke of Bavaria. In 757, their son Duke Tassilo III of Bavaria the magnates of Bavaria acknowledged themselves as vassals of Pépin the Short. Pépin the Short, King of the Franks who was Mayor of the Palace in Austrasia and who had himself declared King of the Franks in 751. Please click on Pépin the Short for further details. Pépin the Short married in 740 to Bertha or Bertrada II of Laon also known as "Bertha Broadfoot". She was the daughter of Caribert (or Herbert), Count of Laon and granddaughter of Bertha, a Merovingian Princess who was in turn a daughter of Thierry (III), King of Austrasia, Neustria and Burgundy. Please click on Bertha for this line. Some sources, eg. World Book 2000, © 1999 IBM Corporation, suggest that Bertrada or Bertha was known as "Queen Goose-Foot" or "Goose-Footed Bertha", and is the original “Mother Goose”. Hence, we can also list “Mother Goose” among our illustrious forebears. Gisela, Abbess of Chelles, who had a son Rowland, who had a daughter Juliana who married her first cousin once removed,Charles the younger, Duke of Ingelheim who was a son of Charlemagne. Charlemagne, Emperor of the West ruled jointly with his younger brother Carloman from 768 until 771, at which time Carloman died. Charlemagne greatly extended his empire, and was crowned emperor by Pope Leo III on December 25, 800. Charlemagne was predeceased by two of his sons, and was succeeded by his sole surviving son, Louis the Pious. Click on Charlemagne for further details. Charles the younger, Duke of Ingelheim, born 772 and died 811 before his father. Charles married Juliana, who was his first cousin once removed. Louis (I) the Pious of Aquitaine, King of France, whose 7X great granddaughter Mathilda of Flanders married in 1053 to William the Conqueror. Please click on Mathilda for this descent. Charlemagne had additional wives, an abundance of girlfriends and many more children. Pépin (I), King of Italy who was crowned King of Italy by his father Charlemagne in 781. Died on July 8, 810, before his father Charlemagne. Bernhard, King of Italy who revolted in July 817 when his uncle, Louis (I) the Pious who had succeeded Charlemagne as Emperor, proceeded to divide the empire among his sons, Bernhard's cousins. Bernhard doubtless felt that his father Pépin had been crowned King of Italy by Charlemagne and that he should follow his father as the full fledged King of Italy. Louis the Pious, however, had a different view of the situation. Seeing as Pépin had died before Charlemagne, Louis the Pious felt that as Charlemagne's heir, he was overall king or emperor; and that Bernhard was perhaps sort of a sub-king. Bernhard's revolt didn't work, and he was forced to submit to Louis in December 817. Eventually, by the Treaty of Verdun in 843, the territory that had been Bernhard's Kingdom of Italy was awarded to Louis the Pious' son Lothaire who became Holy Roman Emperor. Please click to see a Map of the Carolingian Empire after the Treaty of Verdun of 843. Bernard, Count of Senlis was a friend and counsellor of Hugh Capet "the Great" of Neustria. and perhaps Poppa who married in 886 to Rolf, 1st Duke of Normandy. Click on Rolf the Ganger for this line. For further details including an excerpt from George Andrews Moriarty: The Plantagenet Ancestry of King Edward III and Queen Philippa, Mormon Pioneer Genealogical Society, Salt Lake City, Utah, 1985, page 226; please Click Here. Sprota or Adela of Senlis who married William (I) Longsword 2nd Duke of Normandy as his first wife. Click on William Longsword for this line. Beatrice de Vermandois, born in 880, who married Robert (I), King of France. Please click on Robert (I), King of France for this descent. Alice of Vermandois, born 910, who married Arnolph "the Great", Count of Flanders. Please click on Alice of Vermandois for this line. Luitgarda of Vermandois, born about 915 who married William (I) Longsword 2nd Duke of Normandy as his second wife. See William Longsword. Robert married Adelaide, a daughter of Giselbert, Count of Burgundy and his wife Ermengarde. Ermengarde, heiress of Anjou (born circa 1010/1015 and died 21 March, 1076) who married Aubri-Geoffrey, Count of Gâtinaise. Judith of Brittany (982 - 1017) who married Richard (II) "the Good", Duke of Normandy. Albert married Gerberga of Lorraine. Click on The Merovingians for Gerberga's descent from Clovis and the Merovingian Kings. Adelaide married to Hugh "the Great" de Crépi, Count of Vermandois, son of Henry (I) Capet, King of France and brother of Philip (I), King of France. Click on Hugh "the Great" for details. After Hugh’s death, Adelaide married secondly to Reinald, Count of Clermont. Isabel married first to Robert de Beaumont, Count of Meulan. Robert de Beaumont, son of Roger, Seigneur de Beaumont, was present at the Battle of Hastings. Hugh de Beaumont, Earl of Bedford. a daughter whose name is not known. The Sewell Society (where I got started . . . thanks to Ruth Summers.